It's that time again, I'm happy to say, Presto Pasta Night Roundup - #166 this week, filled with the best pasta dishes from around the world, is back and it's fantastic. But who wants to hear from me...after all we've been waiting a whole week since the last one. First in (last Friday before the proverbial ink was dry on PPN #165) was Muneeba of An Edible Symphony (aptly named) with this tasty Cajun Chicken Pasta. Tigerfish of Teczcape is nominated for the Singapore Blog Awards 2010- and she has my vote. 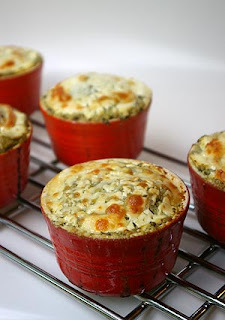 I mean, what's not to love...her photos are beautiful, her recipes very tasty. Not sure if there's still time, but if there is...go vote! In the meantime, check out her Beef & Celery Pasta With Tomatoes. Abby of Eat The Right Stuff - and we always do after a visit there, made Thousand Layer Lasagna Pots that have me drooling and are definitely on my list of dishes to wolf down once I actually get to eat pasta again. This South Beach Diet phase one is hard on a pasta lover. 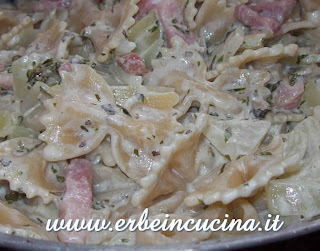 Graziana of Erbe in Cucina used a new to me and unique herb for her Farfalle with Onion and Cinnamon Basil - note to self - find some! Nic, of Lemon & Cheese shares the perfect recipe for those of us who are carbonara-making challenged. 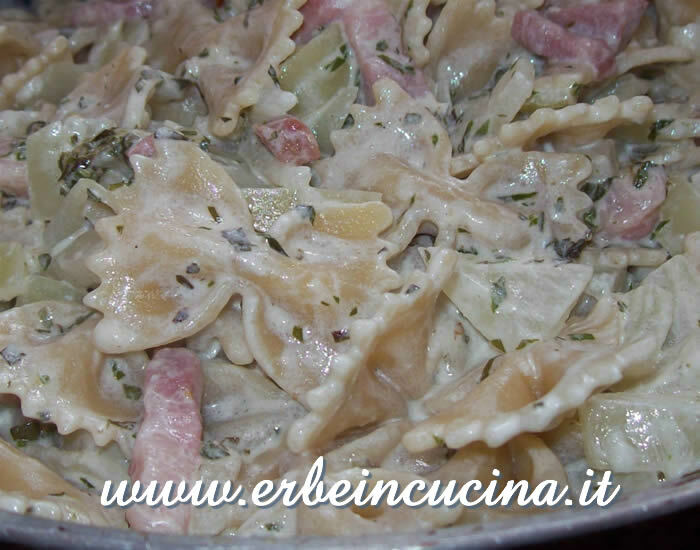 Check out her Zucchini Carbonara for delicious details. 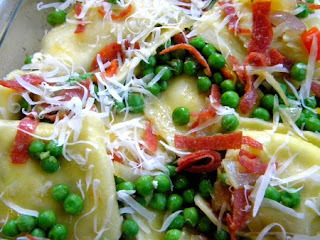 Marye of Restless Chipotle whipped up this tasty Ravioli with Peas & Proscuitto, but I bet the eaters did some slow savoring. Daphne, of More Than Words (I'll say - her recipes are awesome) shares this Creamy Smoked Paprika & Tomato Sauce with Chicken that has me drooling. Creative Sanyukta (I'll Say!!!) 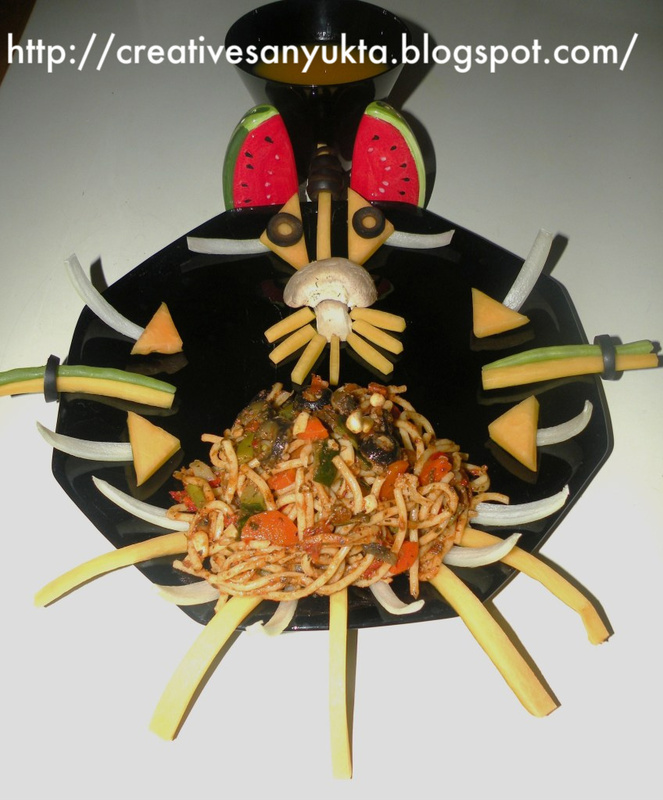 put together this eye-catching dish of Indianized Squash & Veggie Spaghetti with lots of garlic - perfect for me. KC of Kits Chow really outdid herself this week with her own miniPPN. I counted at least eight of her tried and true favorites - mine too. 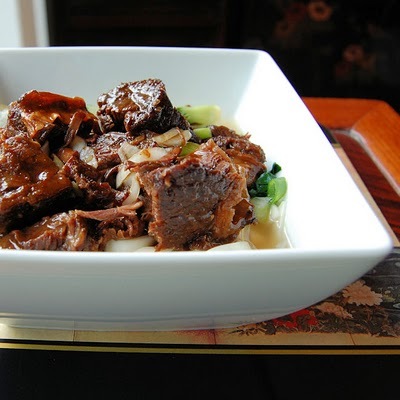 I had a hard time deciding which wonderful photo to include, but decided on this one for the Cantonese Braised Short Ribs. Radhika of Soup & Dessert is a first time PPNer - so welcome and I do hope you make it a habit. This Goat Cheese, Pesto & Swiss Chard Pasta has some of my very favorite ingredients. It will be on my table soon. Joanne, who Eats Well With Others, is back with Homemade Ravioli with Brown Butter, Almonds & Zucchini. I don't know how she finds the time to write her hysterical stories and make all her awesome dishes, and attend Med school. I'm tired just thinking about it, but very glad she does and shares with us so often. 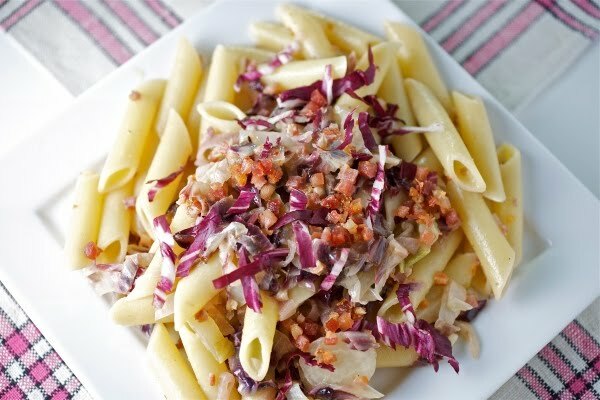 Jean of Lemons & Anchovies is back with a wonderful plate of Penne with Radicchio & Pancetta. It's always fantastic to be able to recreate a dish eaten in a restaurant. A skill I have yet to develop. 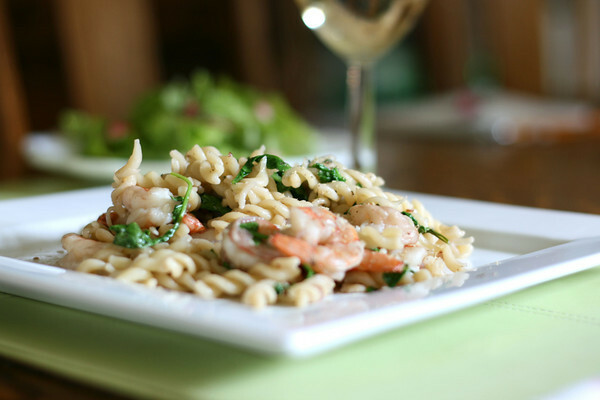 Pam of Sidewalk Shoes is back too, with this mouth-watering Fusilli with Shrimp & Arugula - enough said, except "Pass a fork, please". Claudia of Honey From Rock, another PPNer started out wondering which herbs to use on her pasta. 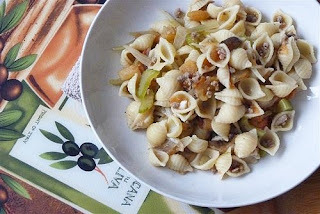 I love the result with this Pasta With Herbs, Sardines & Capers. I, on the other hand, feel like the biggest of losers - even though it's only 4 pounds, actually. No pasta for me, and next week looks the same. Note to self - much more exercise to help the process speed along. 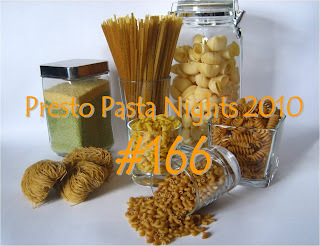 I did share some great pasta resources over here , though. Have fun with it. What a delicious roundup--lots of inspiration! Congrats also on your progress--great job! Hey Ruth,bful roundup...u did an awesome work...thanks for posting my entry..and ur inspiring words..appreciate.looking forward to many more events of PPN and ur delicous recipes........Happy weekend..
congrats about your loser status ruth. and thanks for the delicious round up. Don't give up Ruth, and thanks for persevering with hosting this fun event. My sympathies on the carb restrictions - as a fellow carb lover I feel for you! Kudos on the roundup - and your willpower! PPN is one of the blog events that I enjoy..and follow quite consistently. Thanks. Excellent roundup as usual, Ruth! Your wonderful introductions for each recipe is so thoughtful. super round up as usual! Fantastic Round-up. Thank you Ruth! Yummy! Thanks for this beautiful event again Ruth. I love it all. 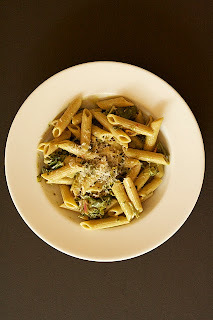 I should never visit PPN on an empty stomach ... now I'm craving all the pasta dishes in this round-up!